The Joe Fernandes Band, also known as “Dr. No”, has been entertaining crowds for over 10 years now. They are a versatile, high energy act that can be used for any occasion. Whether you want to Rock and Roll to all of your favourite hits, or want to pull out those cowboy hats and do a little two steppin’ this band will get your party going. 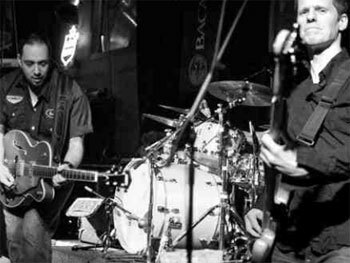 For four years the Joe Fernandes Band had a house gig at Roosters Country Cabaret Sunday nights, and over the years chances are you have seen them playing at one of your favourite events or watering holes. If Rock or Country isn’t your thing and you're looking for something a little mellower, this band can accommodate. The band has also been hosting a jazzy lounge night for the last year and a half and can be as quiet or as loud as you want. If you’re looking for a fun professional band with years of experience you need look no further than the Joe Fernandes band. As one of Vancouver’s busiest studio drummer he is the driving force behind the Joe Fernandes band. Chris has won the B.C. Country Drummer of the year twice now, once in 1998 and then again in 2004. Chris has played with Rick Tippe ( B.C. Country Music’s Male singer of the year) for years and has also backed the likes of Lisa Brokop, the Payolas, Barney Bentall, Collin James and Mike Reno. Noteable Entertainment & Events is a Vancouver based booking agency, party rental, entertainment services and event production company. If you are interested in booking Joe Fernandes Band please contact us.